Stabilizing your 360 video is videos is key. You want to keep the horizon level and minimize any shakiness to avoid making people sick. Although some cameras are beginning to include internal stabilization features, including the Insta360 Air, Nano and Pro cameras and the Xiaomi Mi Sphere 360 to name a few, there are still lots of 360 cameras out there that don’t include this feature. Others, like the Garmin Virb 360, offer internal stabilization of footage up to 4K, but to takeIndividual instance of a shot; a take = each time the camera is started and stopped. advantage of the camera’s full 5.7K resolutionThe number of pixels in an image, typically presented as a ratio of the total pixels on x axis to the total pixels on th... More, you have to forego stabilization. Of course, you can also spend the time to clean everything up in post, but being able to capture stabilized footage in the first place can save tons of time and is a vital when you’re livestreaming 360. In April, the Moza Guru 360 gimbal become the first 360-specific gimbal on the market. Its smaller footprint was made with 360 in mind. The design organizes the counterweights, motors and arms on one plane, so it’s feasible to align them into the stitch line so the gimbal is nearly invisible to your camera. Here is a comparison showing 360 video footage with and without the Moza Guru 360 gimbal. It’s a side-by-side comparison; you can see the other camera/stabilization setupA camera position for a given scene. You might shoot more than one shot from a single set-up (wide shot and close-up). to the side of each clip. I actually chose to hold the non-gimbal test with my right hand (my dominant hand) to give it the best shot at stability. I used two very similar cameras–the older and newer Samsung Gear 360s at maximum resolutionThe number of pixels in an image, typically presented as a ratio of the total pixels on x axis to the total pixels on th... More, stitched in Action Director 2.0, with no additional edits. The first clip shows 360 video captured with a Samsung Gear 360 2017 on the gimbal, held by hand while walking. The second clip shows the same walk with the Samsung Gear 360 on a selfie stick, held by hand while walking. 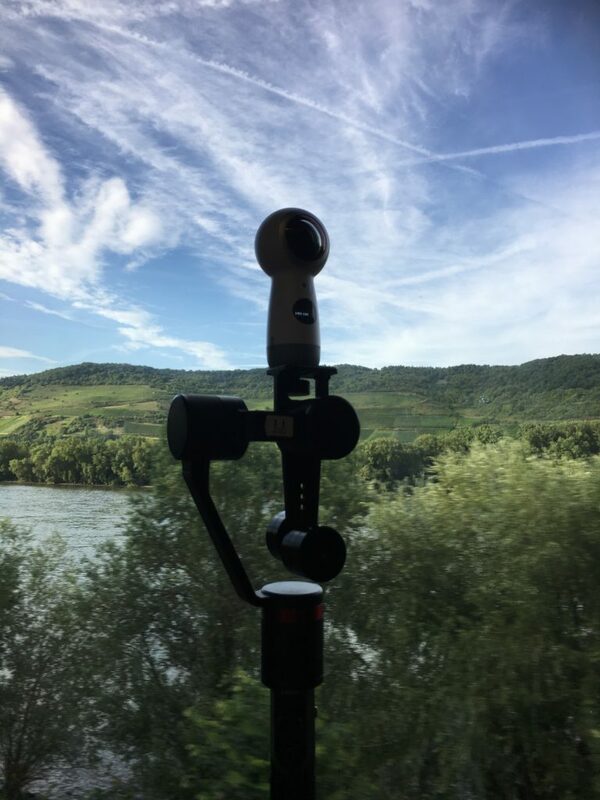 I also have a test where I attached the gimbal and Samsung Gear 360 2017 to a monopod in my backpack–lovingly dubbed “the humiliator” by Nat Geo’s Ami Vitale–for overhead POV shots. This is shown in shots 3 and 5, with the same setupA camera position for a given scene. You might shoot more than one shot from a single set-up (wide shot and close-up). (minus the gimbal) in shot 4. I’ll also be sharing more samples with the gimbal mounted on multiple stacked monopods, on bikes, in cars, and other situations, so stay tuned for that. The Moza Guru 360 is a three-axis stabilized gimbal that works with the older Samsung Gear 360 and 2017 version, the Nikon Keymission 360, Theta S and SC, Dual Kodak PixPro SP360, LG360 Cam, Casio EX-FR200, 360Fly Action Camera, Vuze, Garmin Virb and more. 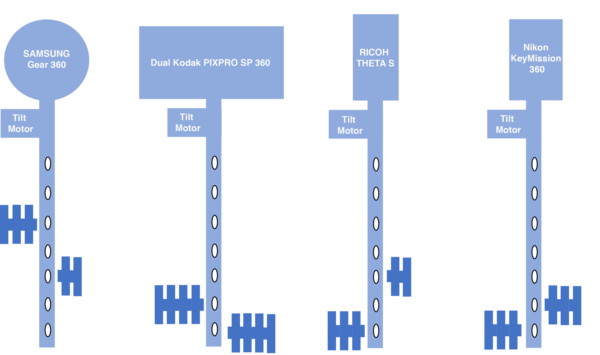 A general rule of thumb is that it works with all cameras under 250 grams, but the design of the camera is also a factor. For example, it might be able to accomodate a heavier camera with a lower center of gravity. It has three modes, lock, follow, and head lock. “Lock” or “all lock” mode locks all three axes, holding the camera lens in a fixed position. This would be most useful when just walking around, for example, when you’re livestreaming. It keeps the camera oriented in the same direction, no matter how you twist the gimble or turn around. So, even if the camera is moving, the viewer can still choose to turn left or right and not be “forced” to look in any direction. It’s the best option if you want to direct the direction of the gimbal/camera. 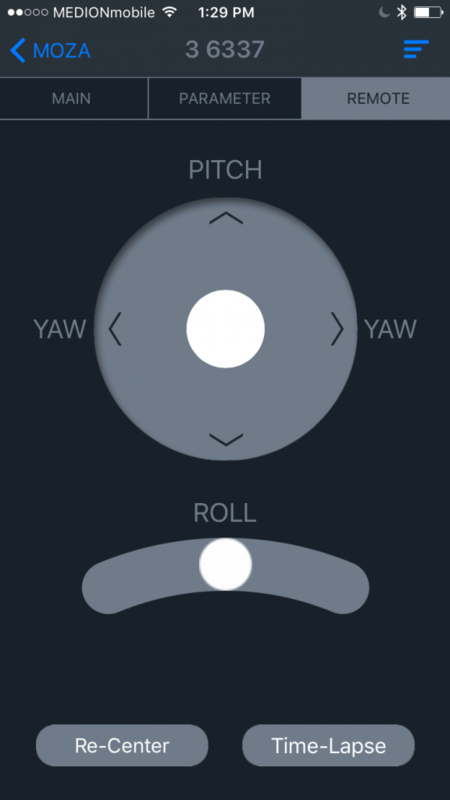 “Follow” or “yaw-follow” mode stabilizes pitch and rollTerm meaning “record,” dating back to a time when physical film was rolled on an axle past the gate of a camera., but leaves the yaw for you to control. Meaning, the camera is held steady as you tilt the gimbal handle forward to backward and side to side, but if you twist the gimbal handle, the camera will follow your direction. It’s the best option if you want to direct the direction of the gimbal/camera. This would be useful when you want the viewer looking in a specific direction, despite twists and turns. For example, if your camera is in the passenger seat of a car, on a train, or attached to a bike. Perhaps you want the camera’s front lens to always be oriented towards the front window, out the side window, or pointing forward in the direction of travel. “Lock” mode locks the head in a particular compass direction. “Follow” allows the head to stay oriented to one point in the scene, regardless of your heading (northThe point of origin where a viewer enters a 360° scene, also serves as a frame of reference for orienting discussions a... More, south, east or west). “Head lock” or “yaw-tilt follow” mode stabilizes rollTerm meaning “record,” dating back to a time when physical film was rolled on an axle past the gate of a camera., while giving you control (and dampening) yaw and pitch. I’m still looking for a good application for this mode in 360 that wouldn’t make the audience sick…maybe if you were using your 360 camera to overcapture? Not sure yet…will report back. The gimbal can also be used in horizontal mode and inverted mode (great for drones, or low angle walking shots). It also has a 5-way analog joystick to control rollTerm meaning “record,” dating back to a time when physical film was rolled on an axle past the gate of a camera., pitch and yaw. The gimbal has a 1/4-inch mount on top, of course, but also has a 1/4-inch mount at the base of the handle to attach to another stabilization accessory. One cool feature about the Moza Guru 360 is that it can also be used for a smartphone or GoPro, and is interchangeable with Moza’s other gimbals, including the Mini-C, Mini-G, and WK wearable mount. The Moza Guru 360 is powered by a single 18650 Li-ion battery (a strange size of battery conveniently located at your local vape store). It can last between 4 and 8 hours, depending on use, on a single charge and can be recharged using the included charger or USB cord. 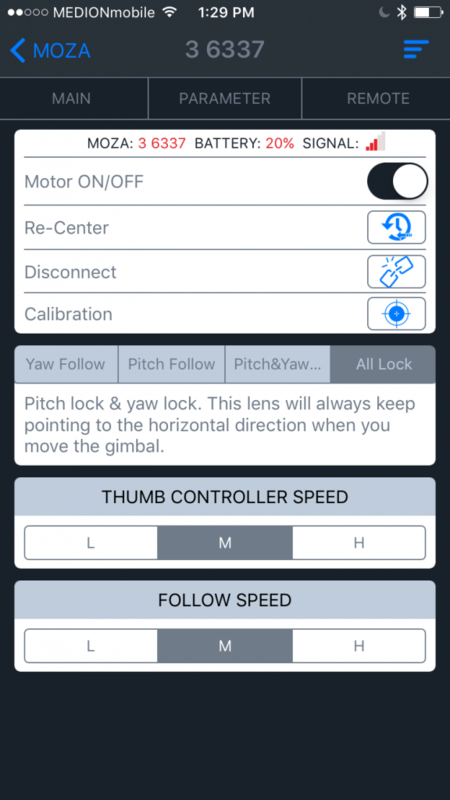 You can also download the Moza app to calibrate the gimbal, adjust its settings and control the joystick via Bluetooth (so you can still control your camera from your smartphone, as well). It’s available for both Android and iOS devices. Of course, it’s good for any handheld motion shots (walking, running, biking, hiking, driving, riding, etc. ), but its 1/4-inch thread on the bottom also helped me get a bit creative with it. It took me longer than it should to get the gimbal set up correctly, by no fault of the device. It was actually a bit embarrassing…However, I did eventually get it to balance correctly. Here’s how I should have set up the gimbal, from the very beginning. I found it easier to do everything when I attached a tabletop tripod to the bottom of the gimbal. 1) Before doing anything else, make sure the rollTerm meaning “record,” dating back to a time when physical film was rolled on an axle past the gate of a camera. arm is oriented correctly. There’s a sticker on it that says “This side up. Make sure the arrows point towards the camera, whether filming in upright, horizontal or inverted mode. So, regardless of the tempting pull tab on the sticker, don’t ever remove it! 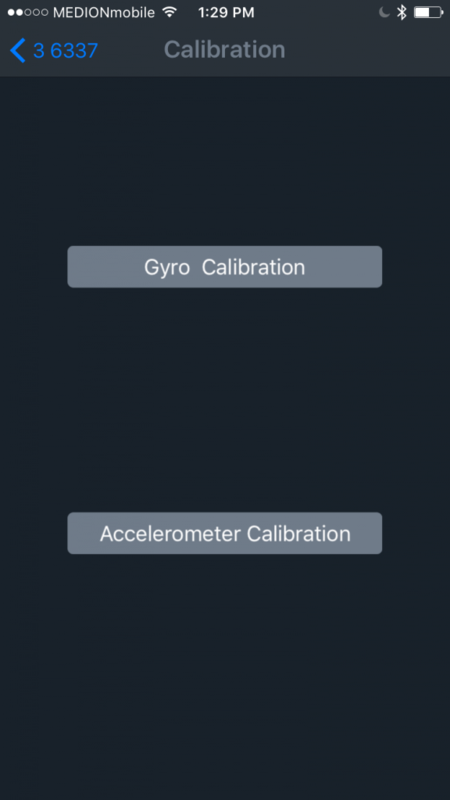 First, Gyro Calibrate the system. To do this, just make sure the camera is perfectly still, whether it’s on its side or upright (with a tabletop tripod attached, to keep the handle from spinning while you don’t have a hand on it). Then, calibrate the accelerometer. Gimbal Guru recommends hanging the camera onto something like you see in the picture here to calibrate. Although you can calibrate with or without the camera on the gimbal, it’s probably for the best you keep the camera off, just in case the gimbal freaks out while it finds its sweet spot. Better safe than scratch a lens! 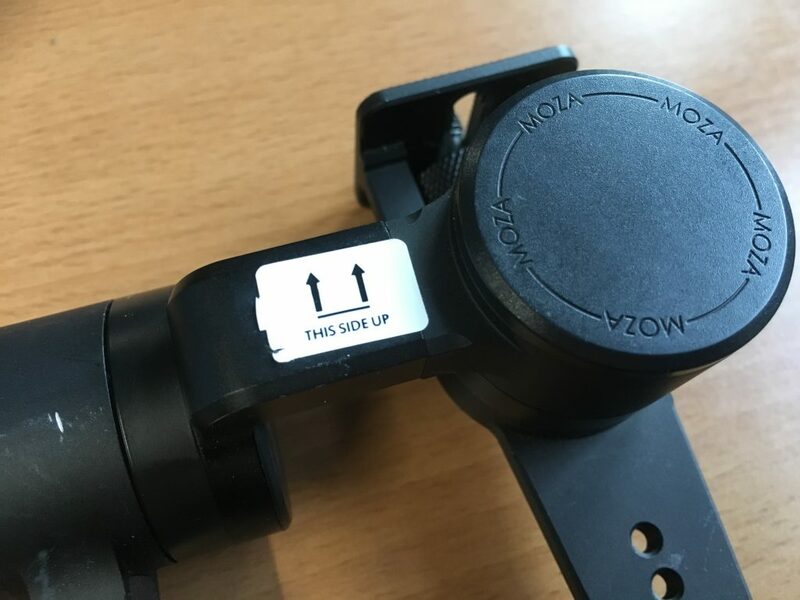 It also makes it easier to move the thumb screw out of the way to hang the gimbal off the edge of a table when calibrating the accelerometer. 3) Next, you’ll attach the camera. Orient the rollTerm meaning “record,” dating back to a time when physical film was rolled on an axle past the gate of a camera. arm to be within the stitch line. This makes the camera nearly invisible, depending on the camera. I had a hard time hiding it entirely when using my 2017 Samsung Gear 360, but it was easy to hide when using the Nikon Keymission 360. The thumb screw is actually in a track, so you can move the camera forward or back in that track. I put my camera near the edge, more towards the motor side. I found this hid more of the arm while making the thread plateA part of a composite, usually intended as a background, though here it refers to a duplicate version of the main shot w... More direclty below the camera a bit more visible. This will just depend on your camera and the scene you’re shooting. And, with the proper counterweight setupA camera position for a given scene. You might shoot more than one shot from a single set-up (wide shot and close-up)., it didn’t cause any balance issues. 4) Set up the counterweights. This is so important! Proper counterweight setupA camera position for a given scene. You might shoot more than one shot from a single set-up (wide shot and close-up). will keep the gimbal balanced so your camera stays stabilized and avoids drifting, but it can also save your battery life and minimize sound from the motor because proper balance means the motor doesn’t have to work quite as hard. 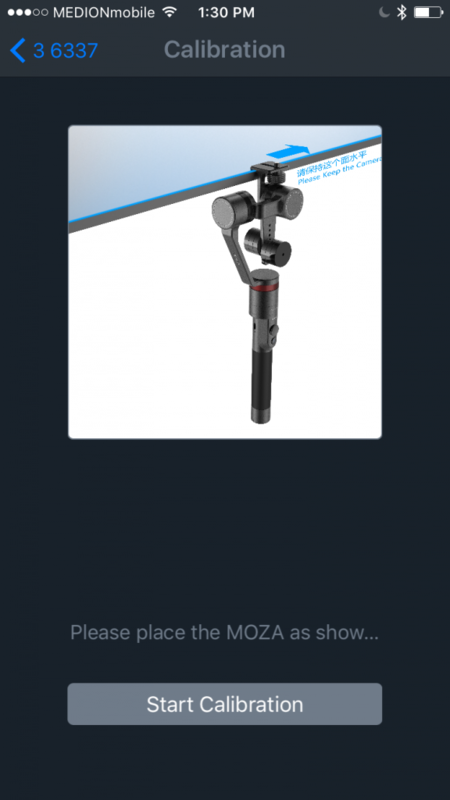 Gimbal Guru has a full counterweight setup guide available here. If your camera isn’t included on their list, don’t sweat it. Just look up the weight of your camera and start with the counterweight setupA camera position for a given scene. You might shoot more than one shot from a single set-up (wide shot and close-up). for whichever camera is closest to yours. It’s worth noting that these are just recommendations. It changes based on your camera design, not just weight. For example, Mic Ty was able to balance a Vuze 3D 360 camera, which weighs 450 grams (almost double what Gimbal Guru recommends as a max weight) because the center of gravity of that camera is so low. So, don’t be afraid to play with the counterweight setupA camera position for a given scene. You might shoot more than one shot from a single set-up (wide shot and close-up). to find something that works for you. For example, I started with the same setupA camera position for a given scene. You might shoot more than one shot from a single set-up (wide shot and close-up). as the older Samsung Gear 360, but ended up using a different setupA camera position for a given scene. You might shoot more than one shot from a single set-up (wide shot and close-up). for the best results. For the older Samsung Gear, Gimbal Guru recommends three weights on the motor side five notches from the bottom and two weights on the other side on the third notch from the bottom. But, the newer Gear 360 is a bit more top-heavy despite being lighter than the older Gear. I ended up with three weights on the lowest notch on the motor side of the gimbal and three on the second-from-the-bottom notch on the other side. Also, pay attention to where in the track the thumb screw is. If it’s more to one side or the other, it can affect your balance! 5) To turn the Moza Guru 360 on, press and hold the power button for a couple of seconds. You should hold the counterweights so the camera is upright when you start the camera. 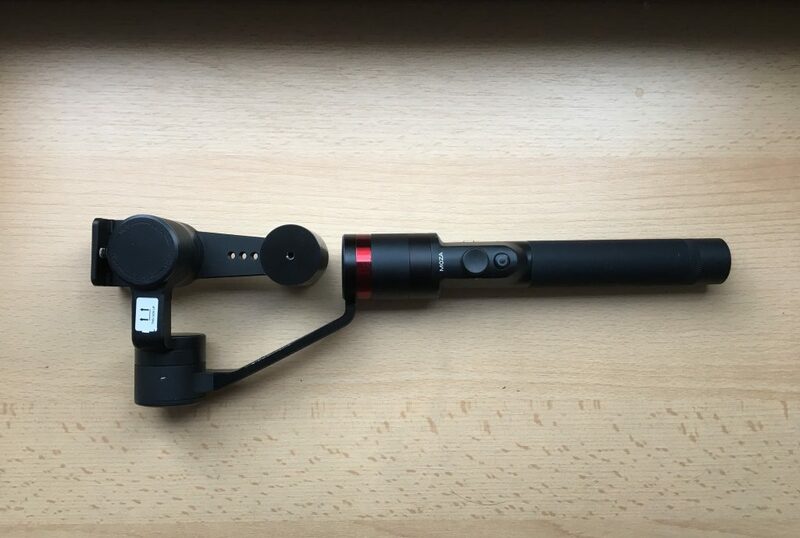 This will make it easier to balance and will prevent the gimbal from freaking out and potentially smacking your camera into the arm or handle. You’ll feel the camera balance; then let it go. If it’s drifting, check your battery life (via the app) and recharge if you’re low. 6) Choose your mode: lock, follow, or head lock (described above). Lock: Press and hold the joystick for three seconds to lock all three axes. Follow: Press the joystick once to select to lock pitch and rollTerm meaning “record,” dating back to a time when physical film was rolled on an axle past the gate of a camera..
Head lock: Press the joystick twice to stabilize rollTerm meaning “record,” dating back to a time when physical film was rolled on an axle past the gate of a camera..
Horizontal: Angle the handle around 45 degrees and the gimbal will switch to horizontal mode automatically in a few seconds. Inverted: Angle the handle downward and the gimbal will switch to inverted mode automatically in a few seconds. One note: there’s no flashlight mode, where you can hold the handle parallel to the ground while keeping the camera perpendicular to the ground. After choosing the right mode for the job, you can orient the camera using the joystick to align the stitch in the most beneficial places in the scene. You can also adjust this while recording, using either the joystick on the gimbal or the Moza app. Press the power button three times to re-center the gimbal to its starting position. 7) Now, you’re ready to get out there with your gimbal and go! You should keep in mind that it would still feel unnatural to move the camera up or down vertically in the scene, so try to keep it level. And, you don’t want to get too crazy with motion. Just because you CAN do something doesn’t mean you should, a) because you can still make your audience sick, and b) because you actually can’t. Your motion isn’t limitless. The counterweights can still hit the arm of the gimbal if you go a little too wild with it. The stabilization looks really good. Almost all of the gimbal can be hidden in the stitch linesThe seams in a 360° video where footage from one camera has been combined with another..
It’s flexible; you can use it for smartphones (with an adapter) or interchangeably with other Moza gimbals. 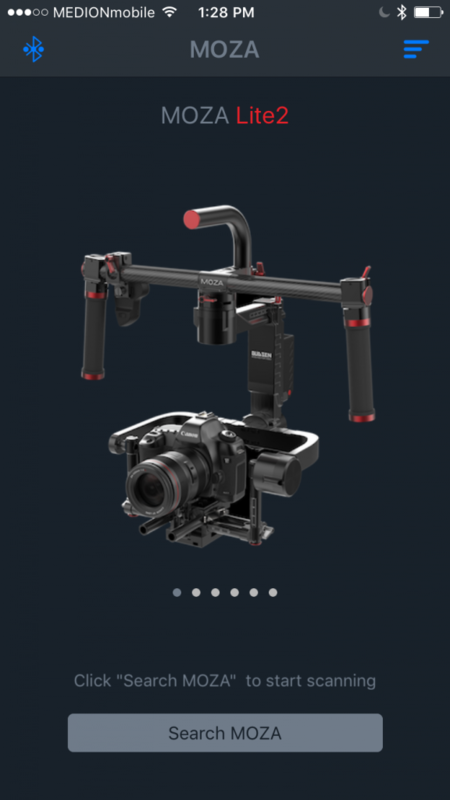 It’s compatible with a lot of different cameras, so even if you have multiple 360 consumer-level cameras, you only need one gimbal. The lock, follow, and inversion modes have some interesting applications for 360. You can control the gimbal with your smartphone. Setting it up for the first time can takeIndividual instance of a shot; a take = each time the camera is started and stopped. awhile to get the balance right. It isn’t going to work with your heavier cameras, like the Z Cam S1 or Insta360 Pro. But, the Moza Guru 360 Air, available for pre-order now for $699, could handle those. There’s no flashlight mode, which would (IMO) be more useful than the horizontal mode. It can feel heavy after awhile (but, my handweights have pictures of Hello Kitty on them, if that tells you anything about my physical prowess). The motor can be loud. Minimize this with proper counterweight setupA camera position for a given scene. You might shoot more than one shot from a single set-up (wide shot and close-up).. And/or use a secondary audio solution. Overall, it’s a really great peripheral that I will most definitely use when livestreaming from IFA and IBC later this fall, when I’m shooting on the move shots and some POV shots, and overhead whether by tripod contraption or drone. I’m definitely making the Moza Guru 360 a permanent member of my day-to-day kit. You can learn more about the Moza Guru 360 on the Gimbal Guru website.